I had the profound pleasure of reviewing the 25th anniversary production of Cameron Mackintosh's Miss Saigon when it opened in the West End last year, which was a truly epic introduction to this magnificent show. So when I was offered the opportunity to watch the tremendous musical once more, now with a partly new cast, I of course couldn't say 'no'! I was first introduced to the new additions during their performance at West End Live earlier this month, which sounded very impressive so I had high hopes that I would love revisiting this musical. However, with a combination of not hugely impressive understudies, distant seats and perhaps too high expectations, while I did enjoy watching Miss Saigon, the production had lost some of its sparkle and I didn't fall as in love with it as I had done before. Set just before the end of the Vietnam War, the musical tells the story of an American soldier, Chris (Chris Peluso), who falls in love with a local bargirl by the name of Kim (Eva Noblezada) at the sleazy Dreamland nightclub run by 'The Engineer' (Christian Rey Marbella). Kim is a naive girl who has only just arrived in Saigon and she is soon swept off her feet by the all-American hero. He could've easily taken advantage of her, but Chris too falls in love with Kim and amid the horrors of the war something beautiful emerges. Wartime tales aren't the most obvious ones to turn into glittering musicals, yet the grand scale of the stories tend to work well in the intimacy of the theatre. Just look at Les Misérables, which has recently become even more popular and even received a Broadway revival after getting an adaptation on the big screen. Miss Saigon too is a a huge-scale show that perhaps doesn't succumb to stereotypical jazzhands and feather-clad girls (although, surprisingly, both of those make an appearance) yet it perfectly fits the musical genre. This is a sung-through show and while perhaps it takes a few moments to get used to, the incredible book and music by Claude-Michel Schönberg, Alain Boublil and Richard Maltby Jr. create a compelling and atmospheric piece, which soon transports its audience to the heat and smoke of Saigon. The fact that the characters sing to one another, rather than talk, becomes completely unnoticeable as you're completely pulled into the world of Kim, Chris and The Engineer. However, I admit that I was disappointed when the character of The Engineer made his first appearance on stage as I instantly knew this wasn't Olivier Award-nominee Jon Jon Briones in the iconic role. His understudy wasn't able to strike the same balance between charming and sleazy, nor did his vocal chops come anywhere near that of Briones'. In addition, while I really enjoyed newcomer Chris Peluso in the role of Chris at West End Live, he didn't give a consistently strong performance throughout the show I watched. He definitely had some fantastic moments, so perhaps he was having an off-night, but combined with not being able to see Jon Jon this led to me feeling somewhat let down by the performances. Eva Noblezada, however, was still every bit as sensational as she was over a year ago. It's astonishing to think that she is still a teenager as her voice is powerful beyond her years and she gives a heart-rendering performance of the naive country girl who becomes a strong-willed woman with only one mission on her mind. She and Jon Jon were the irrefutable stars of my first viewing in May 2014 and on her own she still manages to carry the entire show – watching her perform is worth the ticket price alone! And despite my disappointment with some of the cast, this is still a completely epic must-see show. If you haven't seen this production before, so can't compare performances, then I'm sure that you will be as overwhelmed and impressed by this musical as I was the first time I saw it. It unfortunately didn't quite live up to my memories and being further back in the theatre (I was sat in row X of the stalls this time, compared to being in row H before) also detracted somewhat from my enjoyment. So my top tip for first-time attendees would be to buy seats either in the front section of the stalls or in the first few rows of the circle, as this is one show that you'd want to be fully immersed in to be able to truly appreciate the incredible emotionally engaging story and the grand scale of this epic production. 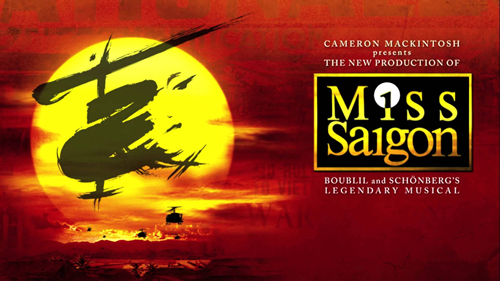 Miss Saigon is playing at the Prince Edward Theatre and is currently taking bookings until 19 December 2015.